With the enormous ecosystem of photo-editing tools available, it's no surprise that photo manipulation has become a weapon of choice for aspiring political satirists this election cycle. But the high cost of professional tools like Photoshop and the prohibitive learning curve of graphic design raise the barriers to entry to produce images like these. Many developers, sensing opportunity in this knowledge gap, have built tools that make it easier to caption images and produce commonly shared memes. Now we're ready to start building the HTML structure. Before we dive into the jQuery, let's think about all the pieces we'll need for our generator and have them ready-built so they're good to go when we start implementing the script. We want the user to be able to type a message, watch as that message is dynamically appended to the background image, and then press a button to take a 'screenshot' that turns the message and the background image into a new image the user can save. For that last one, in order to avoid dealing with security restraints involved in opening a new tab on a user's browser, we'll use a simple lightbox overlay that shows the new image. The CSS to make this work is fairly simple. We'll need a background-image on the and some font and color styles on the to make the generated image look interesting. We'll also need to set the .lightbox div to display: none; position: fixed; z-index: 99 to make sure that it's hidden by default and that, when we use jQuery to show it, it appears on top of the rest of the page. A word of warning: certain styles can mess with html2canvas's ability to render the image preview properly. For example, setting background-size: cover on a background image on or within the preview element can cause that background image to appear transparent or solid black in the image html2canvas creates. If you're getting similar errors, try playing with the styles, and especially consider testing with a simpler version of any dynamic or experimental styles, which may be less likely to render. jQuery is smart enough to know whether we intend to use its functions to grab an element's content or replace it with new content. So all we need to do is attach a listener to the input box that triggers on every keystroke. Each time a user hits a key, jQuery will look at the contents of the input and append them as text inside the element in our image preview. By default, browsers will assume you want to send the contents of the form's inputs somewhere and load a new page when a form's submit button is triggered. But html2canvas actually doesn't look at our input boxes at all. It's entirely focused on making a copy of the image preview area. So we want to override the default response and replace it with our own script. First, we need to make the image, swap it in for the missing image in the lightbox, and display the lightbox. Then, we'll use jQuery's .fadeIn() function, which flips our lightbox element's display style on and also animates it so it fades in over a period of milliseconds we can specify. We'll also feed our new image the data URI we just created as its source by calling jQuery's .attr() function and passing in the src attribute and our data URI as arguments. Finally, we'll add one more block to put on a listener on the lightbox's close button so the user can close the lightbox. And that's it! Our image generator is now ready to go. Now for the hard part: figuring out what kind of meme to make. 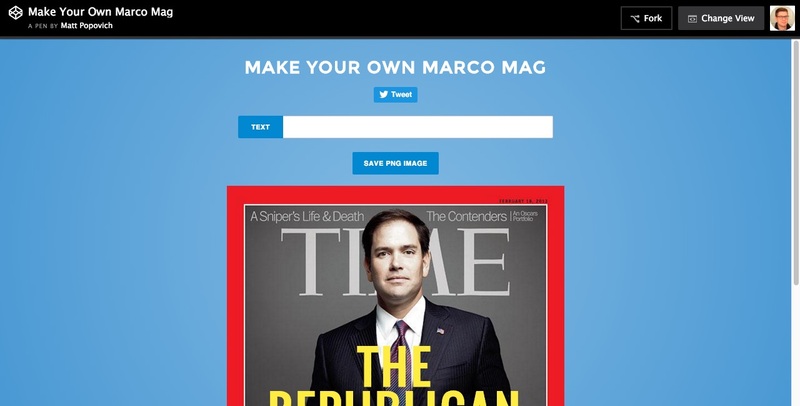 We used Marco Rubio's TIME cover and made a generator that lets you put your own spin on it.